(1) boot press del key or f2, enter BIOS, check the “Advanced BIOS Features” in the first boot device is set to CD-ROM drive starts to exit and save the BIOS settings. Insert the CD into the drive. 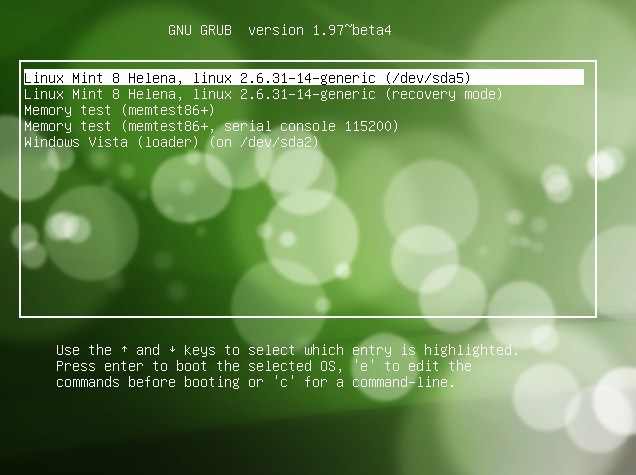 (2) When the Ubuntu boot screen the boot: prompt, enter the rescue and then press Enter. (3) Select the language regions (countries) and keyboard layout, like a fresh installation of the same. (5) Select the root partition (the screen will display a list of the partitions on the hard disk, so you need to know which partition to install Ubuntu on). Should be shaped like dev/discs/disc0/partX, where X is the partition number. (6) You will then enter the command line (a hash). (7) Enter $ grub-install / dev / hdaX X is your root partition where Ubuntu. Keep in mind that this method will install GRUB to a hard disk MBR (Master Boot Record master boot record) above, but not installed in the root partition. For most people this is not a problem, unless you have another one boot manager. In other words, if you use Boot Magic or System Commander boot manager like, then you see above command will overwrite your existing boot manager. If you have to install GRUB to the root partition, the command will be something different. Here is my system I used. From the Live CD (such as Ubuntu Live, Knoppix, Mepis or similar) to start. Open a terminal. Switch to super user (SuperUser). (In Ubuntu enter “sudo-i”, other than the Ubuntu releases enter “su”). Enter the root password. Enter the “grub”, will appear GRUB command prompt. Enter the “find / boot/grub/stage1”. Will appear as “(hd0)” kind of results is in my computer “(hd0, 3)”. In the following command to use your computer to get results. Input “setup (hd0, 3)”. This is the key. In some other guides use “(hd0)”, if you want to write GRUB to the MBR, then use “(hd0)” is not a problem. If you want to write your Linux GRUB root partition, then you need to add a comma after the figures, shaped like “(hd0, 3)”. Remove the Live CD, restart the computer. From the Live CD to boot into the desktop. Open a terminal or switch to a tty (Ctrl + Alt + F1). Enter “root (hd0, 6)”, that is your hard disk and boot partition number. (My boot partition (/ boot) in / dev/sda7, switch to grub is hd0, 6). Input “setup (hd0)”, or your hard disk number. Enter “quit” to exit grub. Note: This method is useful only for systems with only one Linux OS, and is very effective method. If you have more than one Linux system, then, Super Grub Disk will restore partition on your first one found Grub. You will see this message: SGD has done it! Note: Because this is a LiveCD environment, so a user account here or file system changes are temporary. This means that you can not affect your actual installation case, set a temporary root user password and create the directory. In Knoppix, use the following command without entering the password. Now that you have root permissions. Mount the partition containing boot files. You need to be able to access / sbin / and / boot / directory permissions. If the / boot / listed in your fstab file, you will need to mount two partitions. For your work environment to create a mount point – you’ll find it and create a directory is the same. If you need to mount / boot /, you also need to run the following command. You can now load your file system. Review your fstab file and confirm the root directory (/) and / boot / directory location; should be similar to / dev/hda3 and / dev/hda4, but the letters and numbers 3,4 may be a result of your file system and different. Note: The following parts are assumed to be / dev/hda3 and / dev/hda4, you should enter the time according to their own situation to make the appropriate changes. Enter the following command to load your file system and some GRUB need. Now, you need the following command into your work environment. Warning: From now on, you have to modify any of the files will affect Ubuntu system. You have left the LiveCD security environment. Caution. If your / boot / is independent of the partition, enter the following command. Here it is easy to reinstall GRUB. Enter the following command. If you use the above command is not successful, (this is unlikely), you will need to manually configure GRUB (not difficult); If you use the above command is successful, you should read the last one – “Configuring GRUB menu “at the beginning of precautions. Before you make the next step, you need to understand is how to distinguish between GRUB partition. For GRUB, the number starts at 0, the letter expressed in numbers, it starts from 0. For example, / dev/hda1 is in GRUB “hd0, 0”. Similarly, / dev/hdb3 is “hd1, 2”. NOTE: If you have a / boot / partition, then, “root” command must point to your / boot / partition location. If you do not / boot / partition, pointing to your root partition. Note: Your GRUB menu.lst file is used to control the operating system start-up display and the display appearance. Only the contents of this section explains how to start your operating system; does not help you to boot manager is set too beautiful. Here is a sample menu.lst, but deleting unnecessary comments. It is based on the previous example / dev/hda3 and / dev/hda4 assumptions, and also assumes that Windows is installed in / dev/hda1. That’s it. Save and close the file, and then restart a try.